Extracted from Amma’s question-and-answer session. 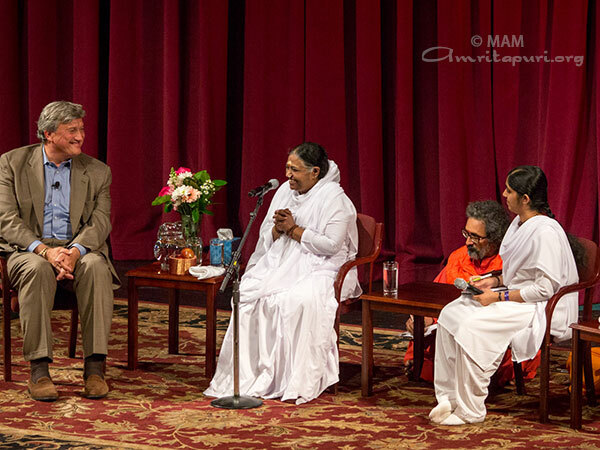 Question: Amma, your presence has brought fragrance to our lives. I would like to know: How do we bring your fragrance to the West, where the children are suffering so much due to drugs and violence? If Amma would say what it is to be done, we will take up the work with full sincerity to help bring up not only this state but the whole country. 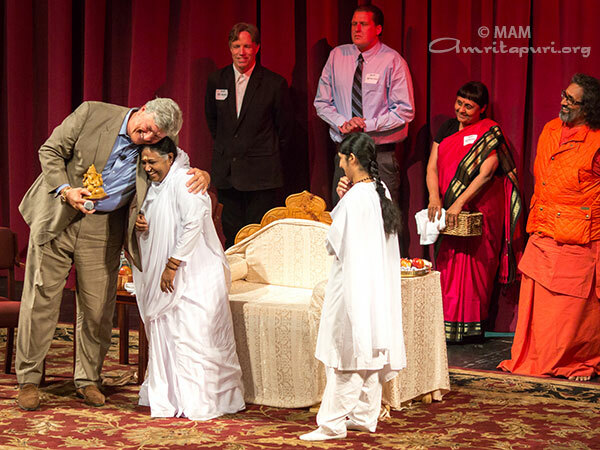 Amma: You can make a difference if you really want to. It is human nature to imitate the people we look up to. This is why we see so many people imitating the fashion and looks of certain athletes and movie stars. Understanding this, everyone should try to become a good role model because, no matter who we are, there is definitely someone, somewhere, watching and imitating us. First and foremost, we must set a good example in our homes for our own children because people pick up almost all of their good and bad qualities from their home. So, parents must lay a strong foundation of values for their children by living those values themselves. One thing you can do to help the youth is to form small groups and visit houses. Maybe you can visit 10 houses a day and counsel the children there. Talk to them, advise them, give them some spiritual teachings. Help them to recognise their weaknesses and to understand the potential consequences of their destructive behaviour. In this way, you can help the children cultivate awareness. A diabetic may take medicine, but if they keep eating sweets, their sugar level will still remain high. This shows us that dietary awareness is just as important as taking medicine, if not more so. So, we need to help children cultivate awareness of the potential consequences of destructive habits. They need the basic knowledge, but they also need awareness and good judgment. Tribal children from places in Northern Kerala, like Attappadi, used to regularly be brought to study at our ashram’s boarding school in Parippally. We would take care of them and give them a proper education. But they would often steal small things, like cooking vessels, and then run away back to their tribal villages. They were used to spending their days wandering in the forests, picking flowers and fruits and climbing trees. They were not used to being educated formally in a classroom. Seeing this, Amma decided it would be better to set up small one-room classrooms in their forest villages. Let the kids come and go to these schools as they please. This way, these tribal children began to slowly develop a taste for education. They started to see its importance. Then they would gradually come to the school more and more and more. Ultimately, some of these children have even gone on to become engineers. So, it is possible to gradually create awareness and appreciation in children of things that they may initially not like but are, ultimately, for their own good. Like that, if you form small groups and visit houses and offer some spiritual education, it will definitely have a gradual effect. 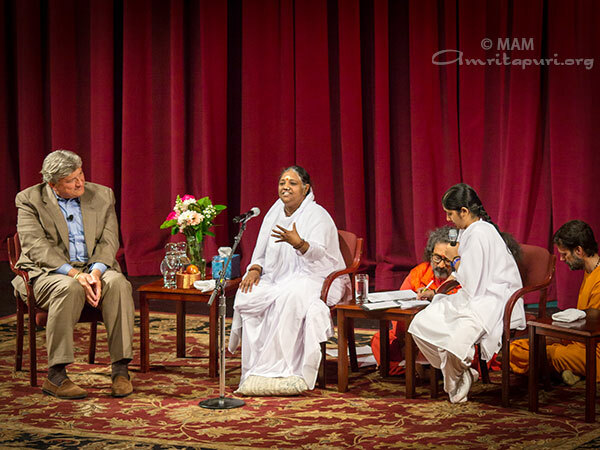 Many children, when they are about 15, confess to Amma that their classmates and friends tell them that studying is a waste of time. They tell them to just make quick money stealing or selling drugs. And the youth present the ability to steal and sell drugs as if they were some great talent. This is what is being taught by the world today. So, we must cultivate awareness in our children. Our youth are like flower buds that are meant to one day bloom and spread fragrance to the world. Today, it is as if they are being eaten away by pests. If we don’t want these flowers to be totally destroyed, we must educate them and help them cultivate proper awareness. Remember, we may not be able to make a monumental change in society, but if we can save even one child, it is a big thing. If only one flower blooms in a wasteland, at least that much beauty is created. If only one tree grows there, at least that much shade is provided. If we can make a change in just one out of 100 children, that is a great accomplishment, and it will have its impact on society. If at first you don’t see any change, don’t get diffident. It will have an effect. A change will come. 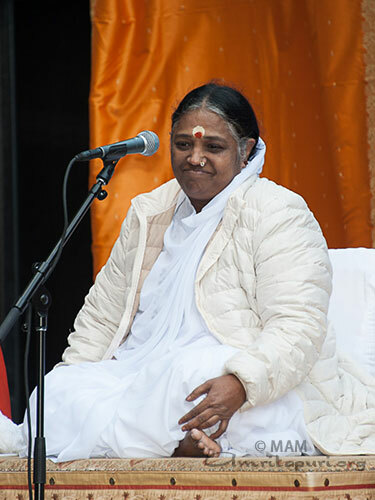 Amma: When we say “no one is my own,” then “everyone is my own, everyone is an extension of my True Self” is also implied. If we place 100 pots of water out in the sun, we will see a reflection of the sun in each and every pot. But, in reality, there are not 100 suns; there is only one sun. Similarly, it is the one and same consciousness that is manifesting in all beings. Why do the scriptures and gurus say that everything is one? Because they don’t want us to be sad or depressed, and they know that understanding this fact—which is the truth—will put an end to that sorrow. When we think that we are the limited body-mind complex, then it is only natural that we will be insecure and afraid. And from this insecurity, we will become dependent upon other people. This leads to attachment and sorrow. Our very existence becomes based upon the words and action of others. If they praise us, we soar up to the heavens in happiness. If they criticize us, we fall down to the floor in sorrow. 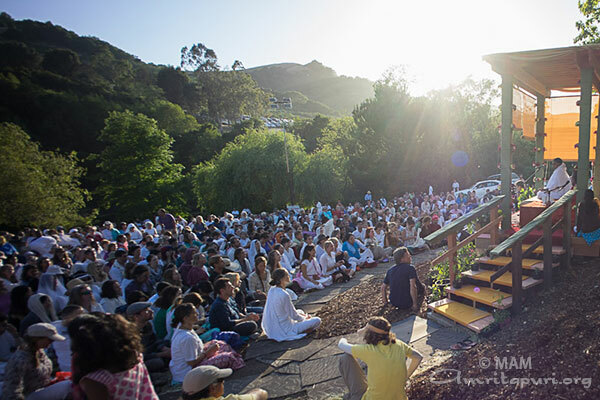 Mahatmas want us to be free of such dependence, and they know that in order to go beyond it that understanding these spiritual truths is essential. Children, we must awaken to this understanding. Then we can see our oneness with others. We must see others as our own Self. That is the only way to overcome the sorrow we are currently experiencing. 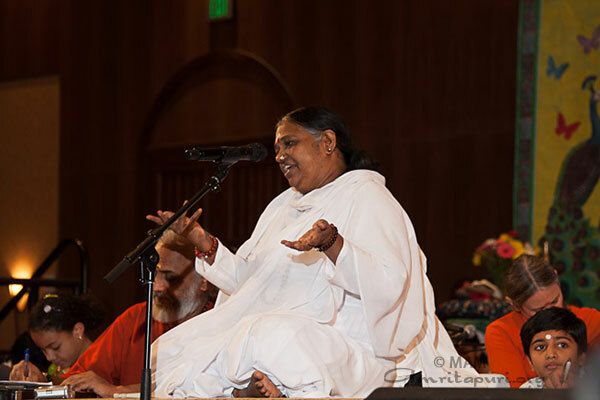 Amma knows this is not easy, but it is possible with constant practice. Just as we have learned to identify with this name, we need to learn to identify with our True Self. Question: I have a question about negative thoughts and emotions. I find myself wondering what the right attitude is and how to prevent negative thoughts and emotions from affecting my life and affecting others. 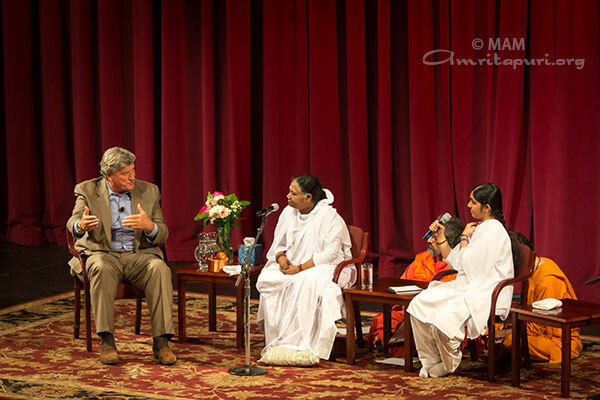 Amma: When you go into a supermarket, you see so many things—some you want and some you don’t. Regardless, you don’t hunt down the manager and interrogate him as to why he stocks things you’re not interested in buying. You just focus on what you came to buy. Similarly, when the various thoughts come, you need to be alert and aware and use your discrimination to decide which are helpful with respect to attaining your goal and which are not. This effort, inquiry and discrimination must come from within. We must ask ourselves what is helpful and what is not. We cannot always ask the guru. If an egg is opened from the outside, it will be destroyed, but when it opens from within, new life is created. 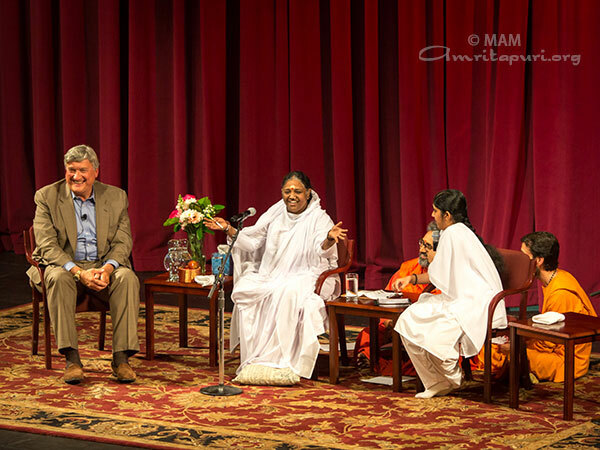 Amma participated in Stanford University’s “Conversations on Compassion” series on Monday, answering questions posed by neurosurgeon Dr. James Doty, the founder and director of the university’s Center for Compassion & Altruism Research & Education (CCARE). The hour-and-a-half-long dialogue took place in Stanford’s 1700-seat Memorial Hall and was the most attended event in the series’ history. Started by Dr. Doty with an initial donation provided by His Holiness the Dalai Lama, CCARE investigates methods for cultivating compassion and promoting altruism within individuals and society through rigorous research, scientific collaborations and academic conferences. Previous participants in CCARE’s “Conversations in Compassion” series have included a diverse array of modern luminaries, including Buddhist monk Thich Nhat Hanh, the English translator to the Dalai Lama, Thupten Jinpa, PhD, spiritual teacher Eckhart Tolle, philanthropist/business-magnate Lynn Tilton, director Tiffany Shlain, neuropsychologist Rick Hanson, Google software engineer Chade-Meng Tan, photographer Lisa Kristine, writer Pico Iyer, Zen Buddhist Roshi Joan Halifax, hotelier Chip Conley, priest and social activist Robert V. Taylor, as well as several of Stanford’s faculty and administrators. 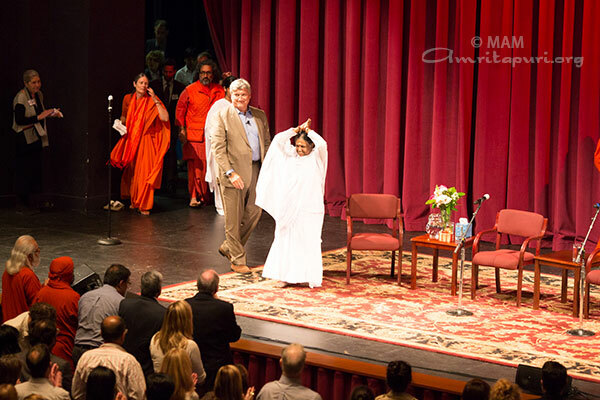 The session concluded with CCARE members and many people from the audience coming forward to receive Amma’s darshan.